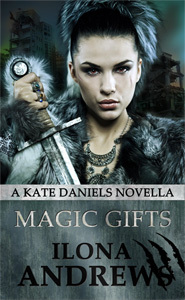 For Christmas, Ilona Andrews has a free Kate Daniels novella, Magic Gifts, available to download for a limited time! It comes right after the latest book in the series, Magic Slays, and crosses over with Gunmetal Magic, the novel about Andrea that will be coming out next year. This novella will also be included with Gunmetal Magic when it is released, but for now it can be downloaded in several different formats to read as an ebook. It is only available for two weeks from when it was put up on December 24, so if you want to read it early, don’t delay too long in getting it!